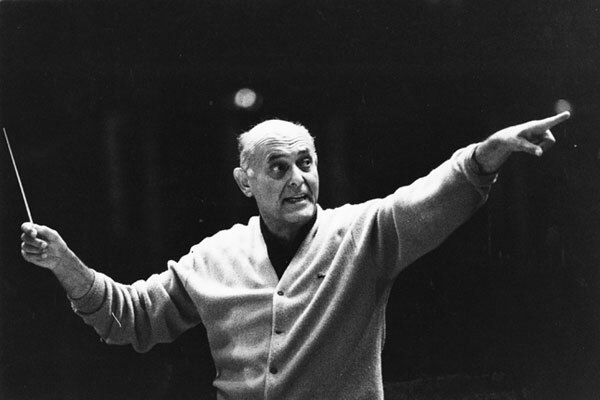 Interpret "Wiener Philharmoniker & Sir Georg Solti"
was one of this century’s most brilliant conductors and a leading figure of musical culture in Europe and the US. The great Maestro made his first recordings for Decca in 1947, as a pianist with Kulenkampff (Brahms and Beethoven violin sonatas) and as a conductor with the Zurich Tonhalle Orchestra (Beethoven Egmont Overture). He continued as an exclusive Decca artist for over half a century and leaves a vast legacy of over 250 great recordings - including 45 complete operas - chiefly with the Vienna Philharmonic, the London Philharmonic and the Chicago and London Symphony Orchestras. He won many international honours for his recordings including 32 Grammy awards - more than any other classical or popular recording artist. Sir Georg studied piano, composition and conducting with Bartók, Dohnányi, Kodály and Leo Weiner at Budapest’s Liszt Academy. Although he made his concert debut as a pianist, he was soon engaged as a conductor by the Budapest Opera. In 1937, Toscanini selected him as his assistant at the Salzburg Festival. Before the outbreak of World War II, Sir Georg went to Switzerland as a refugee, turning again to the piano for his livelihood and in 1942, he was awarded first prize in the Concours International in Geneva. Following the war in 1946, he was invited by the American military government to conduct a performance of Beethoven's Fidelio in Munich. The success of this performance led to his appointment as Music Director of the Bavarian State Opera, whose quality and reputation he firmly re-established over the next six years. During his tenure in Munich, the Salzburg Festival was revived and Sir Georg appeared there, as well as in Vienna, Berlin, Paris, Rome, Florence and Buenos Aires. In 1952, Maestro Solti accepted the post of Artistic and Music Director at the Frankfurt City Opera, where he remained for nine years. From 1961 until 1971, he was Music Director of the Royal Opera House, Covent Garden, and in 1992 was named Music Director Laureate. During his tenure there he achieved international fame for his performances of Die Frau ohne Schatten, the British premiere of Moses und Aron and Wagner’s Ring. With Decca he made perhaps the most famous single recording of all time - the entire Ring cycle with the Vienna Philharmonic. It took seven years to complete and was the first complete studio recording. Maestro Solti's remarkable partnership with the Chicago Symphony Orchestra began in 1954, when he first led the Orchestra at the Ravinia Festival. He returned to Chicago for guest engagements with the Lyric Opera in 1956, conducting Die Walküre, Salome, and La forza del destino. His Chicago Orchestra Hall debut took place on December 9, 1965, and his first concerts as Music Director were in September 1969. Maestro Solti served as Music Director for 22 years (1969-1991) and is credited with greatly extending and enhancing the Orchestra's worldwide reputation - its first foreign tour, in 1971, was under his direction. As Music Director Laureate he was due to conduct the orchestra’s 1000th concert at the beginning of October. Up until his death last year, Sir Georg’s performing schedule was as packed as that of a man half his age, and he had engagements booked up to the 21st century. For his outstanding contribution to music, he received a knighthood from Queen Elizabeth II of Great Britain in 1972. From 1979 to 1984, he served as Principal Conductor and Artistic Director of the London Philharmonic Orchestra and subsequently its Conductor Emeritus. Maestro Solti has received honorary doctor of music degrees from Oxford University, the University of London, and the Universities of Durham, Leeds and Surrey; and in the United States from Roosevelt and De Paul Universities in Chicago, Yale and Harvard Universities, and the Eastman School of Music. He has received an honorary doctor of humanities degree from Furman University, Greenville, South Carolina. An honorary degree "in disciplines of art, music, and drama" from the University of Bologna completes the list of honorary degrees. As well as his record number of Grammys Sir Georg has received many other major awards. In 1989, he received the Gold Medal of the Royal Philharmonic Society, Great Britain's highest musical honour (previous recipients include Johannes Brahms, Richard Strauss, Arturo Toscanini and Igor Stravinsky). He is an honorary fellow of the Royal College of Music, London. In September 1985, Sir Georg was given the title of Professor Honoris Causa by the Minister-President of Baden-Württemberg in Germany. He also received the Knight Commander's Cross (with badge and star) of the Order of Merit from the Federal Republic of Germany and the 1987 Loyola-Mellon Humanities Award. That year, on the occasion of his seventy-fifth birthday, Maestro Solti received the Medal of Merit, Chicago's highest award, and was honoured with the dedication of a bronze bust of his likeness in Lincoln Park. He also received the Order of the Flag of the Republic of Hungary and was named "Musician of the Year" by Musical America. In 1988, he received the Edward Moss Martin Award from the Union League Civic and Arts Foundation in Chicago and, in 1992, the Leonie Sonning Music Prize from Denmark. In 1993, he received the Middle Cross of the Order of Merit with Star from the Republic of Hungary. In that same year to mark his 80th birthday, and a collaboration of over 40 years, the Vienna Philharmonic Orchestra struck and presented to Sir Georg as its first recipient, the "Hans Richter Medal". In December 1993, he was the recipient of the Kennedy Center Honour and the Belgian title of "Commandeur de l'Ordre de Leopold." In 1994, he received the "Ordem Militar De Santiago De Espada" from the President of Portugal, the country's highest civilian honour (the last musician to receive it was Stravinsky in 1954). He holds the French "Légion d'Honneur" and in 1995 received the "Commandeur de l'Ordre des Arts et des Lettres." In 1996, he was given the honour "Knight Grand Cross of the Order of Merit of the Republic of Italy" and the Académie du Disque Lyrique in Paris established the "Solti Prize", to be awarded annually to an outstanding young singer. The first recipient of this prestigious award was American soprano Renée Fleming. In October 1998, a little over a year after his death, Sir Georg Solti’s life and music were celebrated in a special concert recorded for TV and audio at London’s Royal Albert Hall. Mstislav Rostropovich, Angela Gheorghiu, Anne Sofie von Otter, Maxim Vengerov and Zubin Mehta joined the London Philharmonic Orchestra for the occasion, which also raised money for the newly formed Solti Foundation, a fund conceived of by Sir Georg just before he died with the aim of promoting musical education and helping young talent throughout the world. A plaque now adorns the Budapest house where Solti grew up. The conductor's ashes were interred in Budapest next to Bartok's grave.